Senior police and civic officials have been given the task to help in the implementation of the code of conduct in their areas of jurisdiction, he added. MUMBAI: As many as 11,558 unauthorised political advertisements and posters have been removed from Mumbai suburban district ahead of the Lok Sabha polls, an election official said. Besides, 16 police complaints of such unauthorised boards have also been filed in the last one week as part of implementation of the model code of conduct in the district, he said. 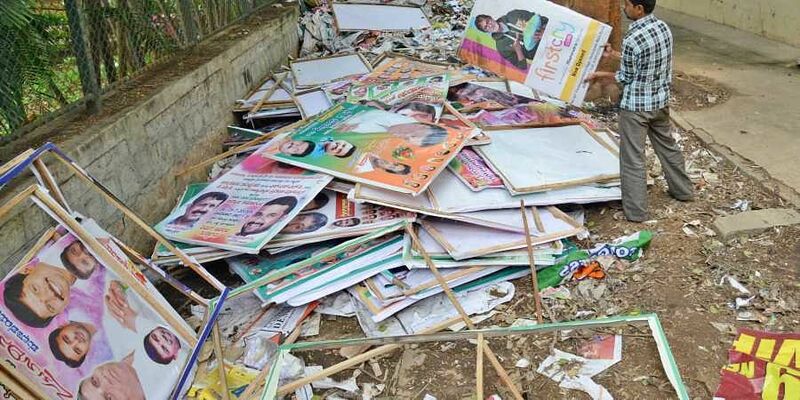 "So far, 9,298 advertisement boards, posters, banners and flags have been removed from public places. Besides, 2,260 such boards have been removed from private properties," he said. Mumbai suburban district comprises four Lok Sabha and 26 Assembly constituencies. Its administrative limits are from Mahim Causeway to Dahisar, Kurla to Mulund and Kurla to Trombay.